When we look at nature, we see millions of wonderful designs that God created. We can copy some of these designs and use them to make our lives better. Other designs are so difficult to understand, even the smartest humans cannot figure them out or copy them. 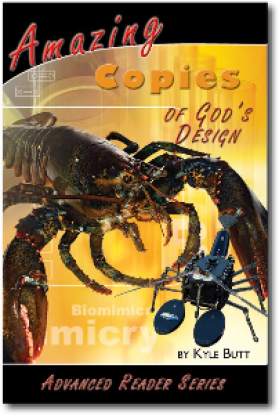 Amazing Copies of God's Design (Apologetics Press). When we look at nature, we see millions of wonderful designs that God created. We can copy some of these designs and use them to make our lives better. Other designs are so difficult to understand, even the smartest humans cannot figure them out or copy them. The designs found in nature teach us very important lessons. They teach us that God is much smarter than humans will ever be. They also teach us that God designed the world just right for humans to live here. God cares about us and wants us to be happy. He wants us to learn about the natural world and use it to help make our lives better. But even more than that, God designed His Word, the Bible, to help us learn how to serve Him and go to heaven. Click on the "Buy Together" tab for a great special price!